The Sergio Leone "Spaghetti Westerns" did not simply add a new chapter to the genre...they reinvented it. From his shockingly violent and stylized breakthrough, A Fistful Of Dollars, to the film Quentin Tarantino calls "the best-directed movie of all time," The Good, The Bad And The Ugly, Leone's vision elevated Westerns to an entirely new art form. 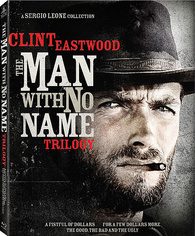 This definitive Leone collection of the most ambitious and influential Westerns ever made includes more than five hours of special features that uncover buried gold in these gritty classics – plus a NEWLY REMASTERED version of The Good, The Bad And The Ugly.